Warts are skin benign growths that are caused by the human papiloma virus (HPV). There are many types of warts, but most of them are harmless. Although they are not dangerous, they can be an aesthetic problem (especially when they are on the face) and sometimes painful. They are also contagious. 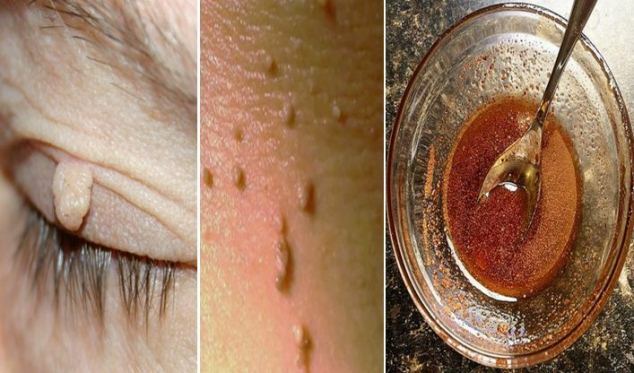 People often go to the dermatologist to get their warts treated, but you could also treat them at home with this simple method. Apple cider vinegar is one of the most used remedies in the world. You can also use it to remove your warts without laser surgery. Just make sure you’re not using it on the warts around the eye area, because it can hurt your eyes. First, you need to clean your wart with water and soap. Gently rub a wet toothbrush on the wart for 15 minutes, then dry it off. Next, put apple cider vinegar on a cotton ball and put it on the affected area. Secure it with a bandage, so it stays in place. Let it sit for 15 minutes, then rinse it with water. By repeating this 3 times per day, for one week, the wart will fall off by itself. If the wart was big, or deep in the skin, it may leave a scar. To prevent that, use aloe vera gel or marigold ointment. If you notice that a scab has appeared, stop applying apple cider vinegar immediately and wait for the scab to fall off by itself. Avoid sweats while doing this treatment, and take very good care of your hygiene. It will make the skin heal quickly and without complications. Make sure you do this treatment very carefully.